More than an award… « "TeresaBruceBooks"
A writer should probably enter a film festival to advance her career, meet people in the business, hopefully add an official selection logo to her resume. But I confess: I entered the Oaxaca International Film Festival because I saw that the trophies for best film and best screenplay were statues by Alejandro Santiago — my favorite living artist ever. I first read about Alejandro Santiago in Raw Vision – an outsider art magazine that celebrates the likes of Thornton Dial and Sam Doyle. I found it a little strange, as if simply because he’s from a small village in Oaxaca, Santiago is somehow an outsider. I can’t think of anyone more connected to his art, to his culture or to the human condition. Consider the seven-year project that vaulted him to fame. He came back to Mexico from living and painting in France and found his entire village empty of men. That’s the flip side of the immigration story we hear in the United States. Women and children hanging onto the thread of hope that their men will make it safely to the other side and someday return. There are no less than three documentaries you can watch about the project, http://movies.netflix.com/WiMovie/2501_Migrants_A_Journey/70147461?trkid=2361637 but the art-world narrative goes like this: Alejandro Santiago had a dream, and in that dream he repopulated his village. The way he made it whole again was to acknowledge the absence. Seven years and a million dollars later there were 2,500 statues representing the migrants, plus one – himself. There were exhibits along the Mexico/U.S. border – all 2501 figures facing Mexico, yearning, and later in museums and galleries around the world. The story wormed into my heart and never left. My own childhood was so nomadic that I’ve never felt the rootedness of Santiago’s “migrantes.” For years I’ve tried to see them. It became almost a pilgrimage. Gary and I have visited Oaxaca six times, combing through its world-class galleries, even renting a car to try to drive to the village where Santiago made the statues. But it turns out maps in Mexico are as abstract as its contemporary art. We found other works by Santiago — fantastic, unforgettable drawings and paintings I’ll never be able to afford – but not the migrantes. What we found instead was an entire culture of artistic expression, an explosion of stories put down in clay, on canvass and spray painted on the walls of Oaxaca in protest. I realize now that Mexico was making me pay my dues – when the student is ready the teacher will come. Thanks to the Oaxaca International Film Festival, I am closer than ever. 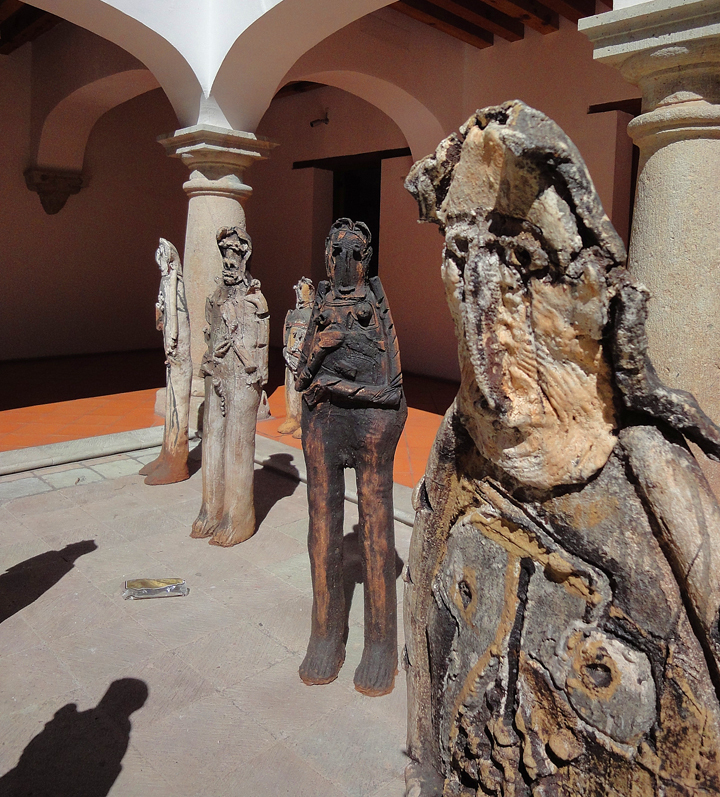 On the mornings before the film screenings began, we wandered Oaxaca’s museums again and found a group of Santiago’s migrantes finally on public display. I stood as still as the statues, suppressing the urge to touch them. And then, on the last day of festival, Ramiz and his wife Diana invited us to a special screening at the artist’s home. As if making the trophies wasn’t enough, Alejandro Santiago opened his own home for a kid’s night – spreading out straw palapa mats on the ground and projecting all the winning animated films on a white courtyard wall. Seeing more migrantes there, in the humble outskirts of Oaxaca where Santiago still lives with his wife and children and seamstress mother, is something I’ll never forget. They appear to be walking out of a jungle. They stand in silhouette atop a corner of an adobe wall. I realize how deeply he must still feel their absence to surround himself with the presence he willed into existence. Which is only a fraction of how deeply their absence must be felt in families all across Mexico – sons, uncles, fathers and husbands offered up, prayed over, ached for. Someday, when I’m more experienced and worldly, I’ll have an elegant speech prepared in the event of winning a major award. 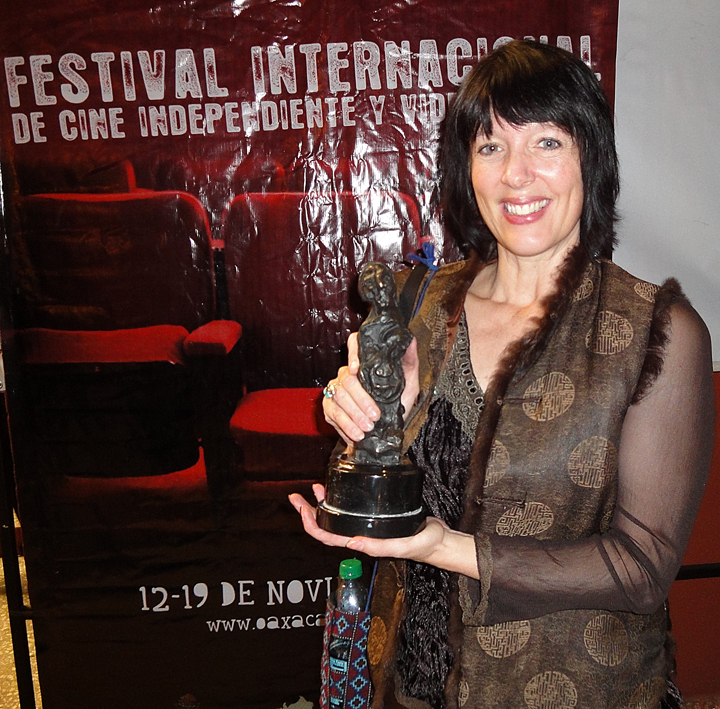 I was thrilled to win best screenplay for “Mask of the Innocent” and ecstatic that my first big festival win was for a female-lead thriller set in Mexico. But on Saturday night, on the stage of the beautiful Teatro Juarez, I didn’t say any of that. I was holding a piece of the Mexico I have come to love. This entry was posted in travel and tagged Outsider Art, screenplays. Way to go Teresa! Congratulations. Of course I’m ecstatic over your win – an awesome triumph and a glorious moment. But I share your dumbstruck joy at the sculpture; now to learn of your followup story – I am wilted in sympathetic pleasure. How wonderful for you both.